The 126-year-old Ketchum Congregational Church has been rebuilt to match its original form. One of Ketchum's oldest existing buildings, the Congregational Church constructed in 1884, has reopened as the Picket Fence Bedding Showroom after sitting empty for years, and looks brand new. That's because almost everything about it is new. Erik Zimmerman, one of the key builders for the church's renovation, said the original plan was to merely repair the church, affectionately known as "Louie's" for the pizza parlor housed there from 1967-1999. He said that plan was quickly abandoned once builders realized the church needed far more than a few boards and a fresh coat of paint. "It was just unbelievable," he said. "I couldn't believe it didn't fall in on itself." Zimmerman said almost everything had to be scrapped, calling for the church to be reframed and rebuilt. "There's some old lumber in the walls but nothing structural," he said. The church is now completely rebuilt and the showroom is open for business, with the building more of a "replica" than the actual church. Zimmerman said the building's owners, John and Lynn Simpson from the San Francisco area, bought the building in summer 2007 and eventually decided they needed more space and built an addition to it for The Picket Fence's online retail business. However, they honored the city's wishes to keep the church's exterior true to form. Zimmerman said the lost steeple was rebuilt, the door was constructed to match the original door seen in late 1800s photos, and the siding was cut in the exact shape of the originals. "Although different materials were used in restoration, the city appreciates that the building's original church vernacular was maintained and is able to be part of our community," said Ketchum Planning Manager Stefanie Leif. The building sits at the corner of Sixth Street and East Avenue next to The Picket Fence, but has had a troubled past. After Louie's closed in 1999, the building became a focus of controversy. While some locals thought spending any money on the old building was a waste, others formed a group called Save the Church. 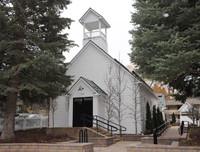 The Ketchum-Sun Valley Historical Society's Save the Church committee raised more than $100,000 to renovate the building, which at that time sat empty at a city-owned storage lot on Lewis Street. Talk persisted of moving it to the Park and Ride site for a museum, but it was decided that the church and YMCA, to be built there, couldn't both be on site. The argument was put to rest when the current owners bought the building in 2007. The $100,000 raised was then split among other projects in Ketchum and Sun Valley. Ashley Howe, marketing director for The Picket Fence said it cost "a lot more" than $100,000 to rebuild the church, but wasn't able to pinpoint the exact construction cost. Zimmerman said a plaque telling of the church's history would soon be installed outside the building.